On Friday 14th of January, we invited some Ocean Blue anglers, friends and media mates along to take part in the Ocean Blue Harbour Day. As Ocean Blue is Sydney based we thought our city’s majestic harbour would be the perfection location to do a soft launch for our upcoming Vanuatu Mothership Adventures, and we weren’t disappointed with our choice…it turned out to be a fantastic day! The day’s proceedings started at the leisurely time of 8.45am, meeting at Cockle Bay Wharf Darling Harbour, where the 50ft cutter ‘Cooloola’ aka the Vanuatu Mothership was moored. It was a stunning morning. 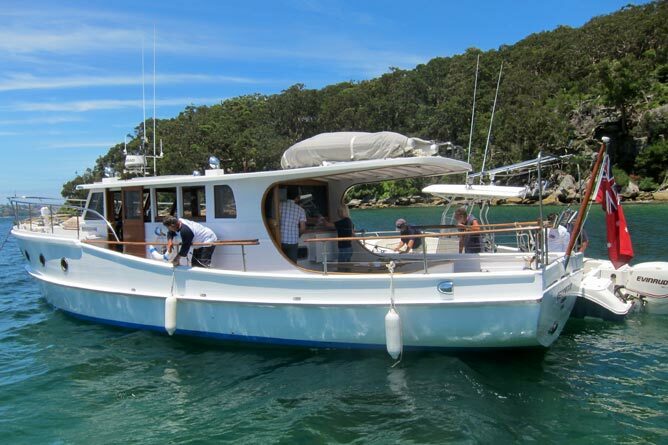 The Cooloola, as well as a superb 32ft Edgewater centre console, will soon be heading to Vanuatu to begin mother-shipping throughout the islands. This year we’ll be running these exciting new Vanuatu fishing charters, offering GT popping, dogtooth jigging and all round sports fishing to serious anglers. I’m from Sydney ,we chartered cooloola for 4 days and had the best time on board and will do it again. Great holiday.